I was hoping I’d get the chance to watch the new Criterion release of Lindsay Anderson’s This Sporting Life (1963) this week, but unfortunately I haven’t had the opportunity to. Since I’ve seen the film before and I have great respect for it, I really have no problem recommending the new Criterion disc. It promises to be one of the best DVD releases of the year. I hope to delve deeper into the film in the future after I have a chance to view it again so you can expect to see more posts from me about the British New Wave and British cinema in general in 2008. In the meantime, if you haven’t had the pleasure of seeing Anderson’s gritty bleak drama yet, I highly recommend This Sporting Life. The film was produced by the talented filmmaker Karel Reisz (Saturday Night and Sunday Morning, Morgan: A Suitable Case for Treatment, etc.) and his influence on the production seems somewhat apparent when you watch the film. This Sporting Life is really a pivotal film in Lindsay Anderson’s directorial career and undoubtedly one of the most important films to come out of the British New Wave. It also features one of Richard Harris‘ finest performances. The new Criterion DVD boasts a lot of great extras including multiple short films by Lindsay Anderson, audio commentary by Paul Ryan and David Storey, a documentary and interviews with people who knew and worked with the director. 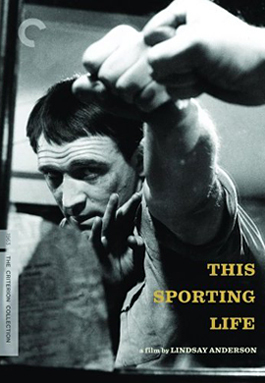 Criterion’s two disc DVD presentation of This Sporting Life is currently available from Amazon for $34.99 and the film is also available for rent from online sources like Greencine and Netflix. Great film by a great director. I mentioned both if and O Lucky Man in my Oscar posts for those years and I still say far too many so-called cinephiles are blissfully ignorant of his work. And Brittainia Hospital completes his great Malcolm McDowall trilogy. I recently saw Saturday Night, Sunday Morning and was fairly blown away by Albert Finney’s James Dean-like intensity and looks. Terrific stuff. This Sporting Life is coming up in my Netflix queue. Have you seen Ken Loach’s Kes? It’s a few years older, but definitely part of that “kitchen-sink” realism movement in UK film. Very worthwhile. No American DVD, though. But I know that won’t stop you! OK – I’m intrigued. You never steer me wrong – I’ll put it in queue. Holy crap! I just came over to check the comments and I see this Kes comment by Will E. Will, I swear I didn’t see this before writing it (which I couldn’t of because I wrote it last week) but I just put up my post on Kes. Geez, what are the odds? I didn’t think anybody else even knew about that movie. It’s superb! When I saw it two months ago I was absolutely floored! I hope I expressed that in my piece well enough because I found it just amazing, really. An entire period of grim films, but well worth the viewing – films have never been the same since. Harris and Rachel Roberts both should’ve won Oscars for “This Sporting Life”, and the look of this film is mirrored constantly on independent films still today. The portrayal of a professional athlete is definitive, and this is the best sport film ever made. The whole Brit New Wave is almost like watching a series train wrecks, but so many quality moments came out of it, and so many wonderful actors and actresses made their marks, it’s influence is unrivaled in my judgment. BTW, I was tickled to see the clips of that period’s tail-end film “Poor Cow”, by Ken Loach, grafted into Soderbergh’s wonderful noirish “The Limey” from 1999, with the awesome Terence Stamp, still an angry young man even when old. We should start a “kitchen-sink” / “angry young man” British new wave blogathon but I have a feeling we’d be the only ones contributing. It’s my favorite “genre” from the sixties (I put it in quotes because it covers comedy to drama but it’s easier to just call it a genre). The Lonliness of the Long Distance Runner, The Luck of Ginger Coffey, This Sporting Life, Look Back in Anger, Georgy Girl, The Entertainer – what a great set of films! Turner Classics had Kes on a month or two ago; I think it was Tracey Ullmann picking her favorites (also Withnail & I which I got to see for the first time). Can’t remember how I heard of it–I think it was mentioned in the post-punk bio Rip It Up, Start Again. I knew it wasn’t on DVD so I made sure to set the DVR. Jonathan, I’ll be sure to check out your post on it. To everyone else: keep your eye on TCM! I saw this film years and years ago. I really enjoyed it. It was one of my favorite performances by Richard Harris. I’ll definitely have to check it out again since it’s been so long. I agree that Harris and Roberts were superb in this film, but I tried twice to get through it and couldn’t. I don’t think I really vibrate at the same speed as the Angry Young Man films. Didn’t really like Loneliness of the Long Distance Runner either. But if you find this your cuppa, all the films mentioned are among the best of the lot. I’m surprised (and happy) by all responses to this post since I mentioned the film as well as Anderson numerous times last year (including in the linked Richard Harris post above), but I was under the impression the film didn’t have a large modern audience. In general, British cinema seems to often be neglected by critics, but it was really my first love when I was a very young thing and just getting seriously interested in film in the early 80s. Anderson is one of my favorite British directors and I tend to enjoy all of his films that I’ve managed to see, including This Sporting Life. I was rather lucky since I got to see a lot of great British cinema from the ’60s and early ’70s when I was in my teens (early-mid ’80s) at local revival houses. For one reason or another the work of directors like Anderson, Richard Lester, Nicolas Roeg, Ken Russell, etc. was shown a lot then. I have seen Kes (really wonderful film) as well as all the other movies mentioned except for The Luck of Ginger Coffey, which I’m very curious about. For anyone who’s interested in British cinema, I highly recommend spending some time exploring the British film site Cinedelica, which I occasionally write for. You can find lots of of reviews, clips, etc. there of British films as well as other stuff. I thought some of you might be interested in my blog partner’s article on the British Free Cinema. As an aside, it’s nice to see Julie Christie up for the Best Actress Oscar for “Away From Her” – a New Wave angry young woman who made good. Caught Kes a few months back and really loved it. Want to review it again to soak up some of the smaller moments that I missed the first time around due to some distractions during viewing. I also echo the previous commenter’s sentiments on The Loneliness of the Long Distance Runner – I found it to be a long, boring stretch of nothing much, and have relegated it to my top 10 most overrated films of all time, like Network and Minnie and Moskowitz. (Or, for that matter, most of Cassavettes output. I know that’s heresy in most film lover’s eyes, but I’ve never bought the Cassevettes myth, no matter how many pieces I’ve read arguing his aesthetic strengths).